This year I had the pleasure of creating a small set of 4 sketchcards for Comics for Cures, to benefit the American Cancer Society. 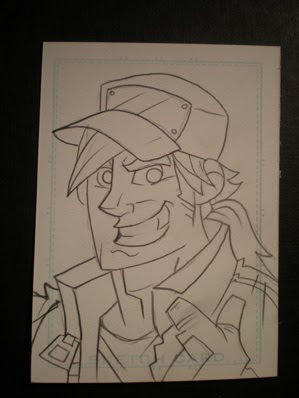 Artists donate sketchcards for the show. The sketchcards will then be part of a gallery show, and after that they're put on eBay, and all proceeds from the auction go to the American Cancer Society. It is pretty awesome, and whenever I have the chance of helping out with my scribbles, I'm glad to jump at the opportunity. The auction was supposed to go live on April 3rd, but I was just told that the date was moved to May 22nd, so it'll still be a while before you can bid on those cards. First, here are the penciled lines. 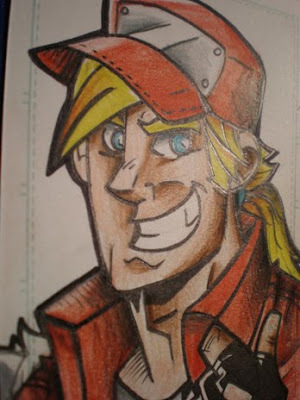 Why did I go with Terry Bogard? 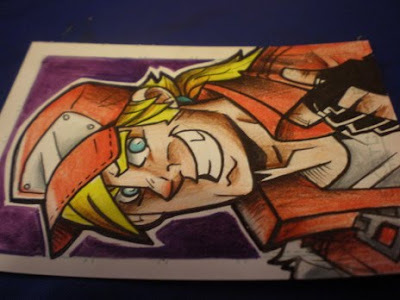 Well, I love the game series King of Fighters, and Fatal Fury too, where this character is from. He's not one of my favorites from either game, but I had never drawn him before so I figured I'd give it a shot. Also, I think he's a popular character and so his card will probably sell well in the auction (I hope). 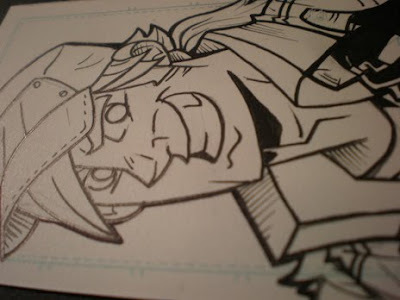 Here I've moved on to inks. I kept it pretty clean and simple. The cards are relatively small (about 6x9 cm.) and I'm not really used to drawing small, so the pose isn't very original or fresh, but I tried to make up for it. Started laying down the colors with my mighty colored pencils. Well, I say mighty but in reality I hardly ever color with colored pencils. The scanner destroys the coloring and that made me almost quit coloring pencils a long time ago. But I enjoyed the practice, and I think I might have to keep going at it. I love the organic feeling of coloring traditionally as oposed to digitally. Ta-da, the card is done here! Just added a simple background that makes Terry pop out a little more. As you can see it's a fairly simple process, and a lot of fun. I hope this card raises a lot of money for the good cause. Stay tuned, I may do similar posts of my other cards!